GRANDMA ON THE FRONT PAGE OF THE NY POST!!! 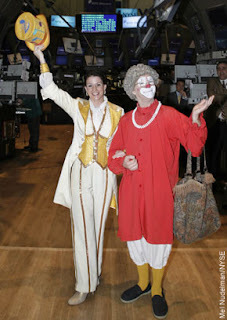 LAUGH & CRY: Grandma the Clown and Carrie Harvey of the Big Apple Circus (pictured) failed to brighten up Wall St. by ringing the opening bell yesterday. If you've thought Wall Street is being run by a bunch of clowns, yesterday you were right on the money. 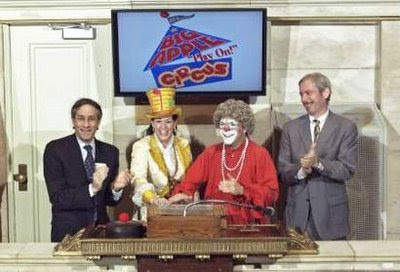 Members of the Big Apple Circus took the reins of financial power by ringing the opening bell at the New York Stock Exchange. 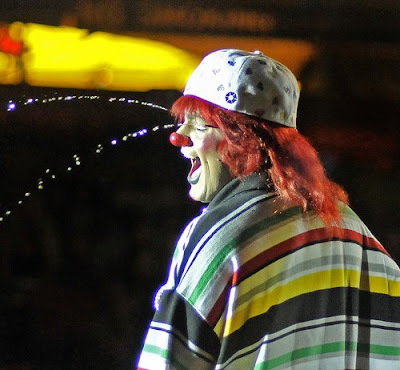 The exchange invited Grandma the Clown and Master of Ceremonies Carrie Harvey to both honor the circus' 31st season of entertainment and perhaps bring a bit of Main Street levity to traders battered by a collapsing market. After ringing the bell, Harvey and Grandma wandered the floor trying to spread joy and merriment, placing funny red noses on exchange officials to touch the funny bones of even the most shaken traders. 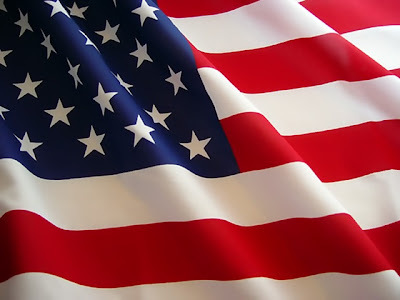 But by the end of a roller-coaster day of trading that saw the Dow Jones industrial average whipsaw from 300 points down to just above even and then right back down to finish off 337 points, good humor was in short supply. "What can I say? The market ended down nearly 350 points. 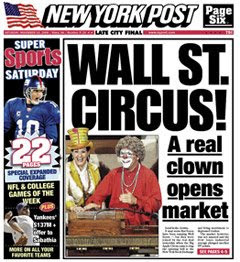 Even the Big Apple Circus clowns couldn't help," said Eckhart & Co. trader Peter Costa as he trudged off the floor. 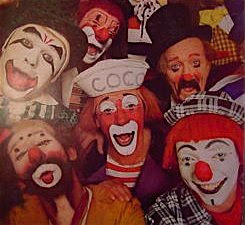 Walter London, a trader with Coffey Inc., said he was so "depressed" that even a clown's mirth could do nothing to help. "There was no lighter mood on the floor. Living this day in and day out is not fun," he said. 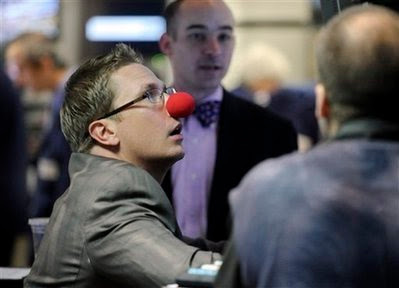 Some analysts said the attempt by the NYSE to send in clowns to brighten the grim mood was childish. "It's like they're trying to be the Make-A-Wish Foundation, cheering up a terminally ill child," said Bill King, chief market strategist of M. Ramsey King Securities in Chicago. "It's a great metaphor for a financial system that has become a joke. "It's great to try to create some levity, but there is definitely some unintended symbolism here." 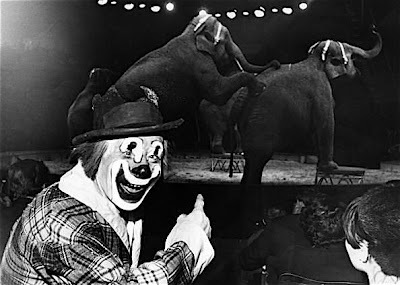 Despite the gloom and doom, the circus members said they considered the experience an honor. "It was the most phenomenal experience," Harvey said. "I rang the bell. It was so magical. I just felt privileged to be there. "The power behind it - you are really ringing the bell, and it is loud," she said. "And I speak for Grandma as well." By the time the market closed, all efforts at amusement were abandoned when officials - in a more traditional approach - tapped executives from the employee-management company Manpower to ring the closing bell. Click the title of this post to watch the NYSE video of the event! The "Crying Eyes" bit. Never fails! This and a fright wig can get a good clown 7 minutes. It's seen here on the Cole Bros. Circus so I'm sure it got no more than 5 seconds. 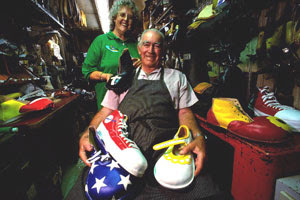 News today from Greg DeSanto and Wayne Sidley is that Clown Shoes and Props founder and member of the very first class of the Ringling Bros. and Barnum & Bailey Clown College, Mr. Wayne Scott is doing very poorly today and that his time looks to be coming to an end. If you were putting it off, now might be a good time to give Marty a call and let her know that Wayne is in your thoughts and prayers. On the 11th hour, of the 11th day, of the 11th month 90 years ago WWI ended... and my grandfather, Mr. Dennis Long returned home. Everything that a really great clown gag should be... and what they almost never are. The Big Apple Circus clown alley swings for the fences and hits one way out of the park with "The Horse Wash" from their 1991 production Greetings from Coney Island. At 6:10 (after the conclusion of Katja Scumann's horses) you'll see John "Mr. Fish" Lepiarz, Jeff "Le Clown Gordoon" Gordon, Oaf and Barry "Grandma" Lubin with assistance from Ms. Schumann. 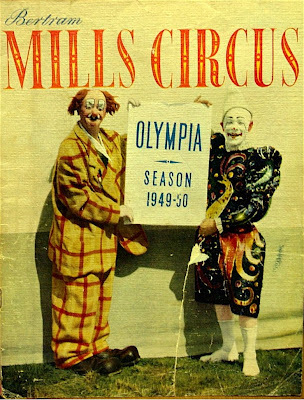 Nicolai "Coco" Poliakoff and Percy Huxter on the cover of the Bertram Mills Circus' program for the 1949-50 season at Olympia. Jimmy Scott at the Bertram Mills Circus at Olympia, December 17, 1965. The former Mr. Valeriy Serebryakov, now known as "Val De Fun" and headed to Monte Carlo. My new stage name will be "Val U Pak" and I will be appearing in your mailbox and your Sunday newspaper. 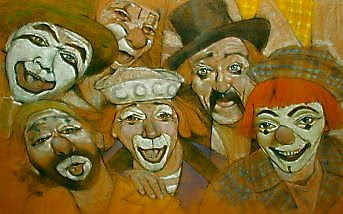 Members of the Ringling Alley of 1965 in watercolor from a photo used on the cover of The Saturday Evening Post April 10, 1965. Bottom Row: Mark Anthony, Michael "Coco" Polakov, Freddie Freeman and some guy from concessions. Coco told me that this photo was taken right after a show and that's why Prince's skullcap in askew and Coco isn't wearing his nose. 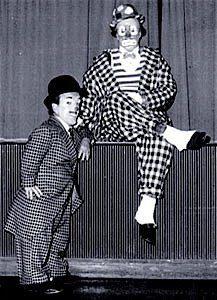 The photographer asked the clowns to pose after they had stared getting changed. The ones in the photo are the guys who hadn't started taking their makeup off yet. They hastily arranged themselves, posed, and then went back to getting changed. They did it so quickly Coco didn't realize he'd already taken his putty nose off. Would someone please be good enough to explain this to me?